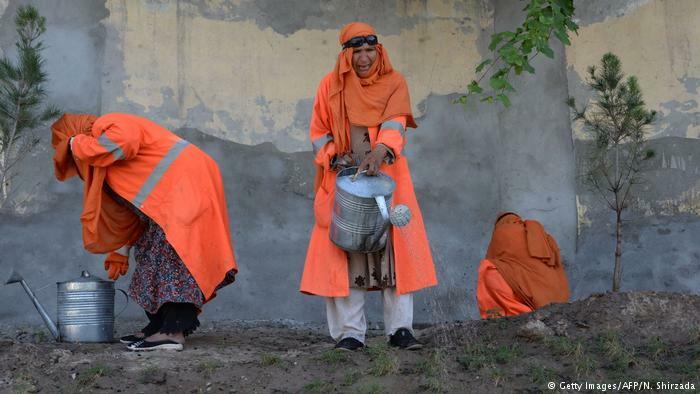 A hood and scarf partially hiding their faces, the women working in the eastern city’s public gardens wear an ample fluorescent orange work blouse – like their male colleagues – which contrasts sharply with the deep green of the grass. 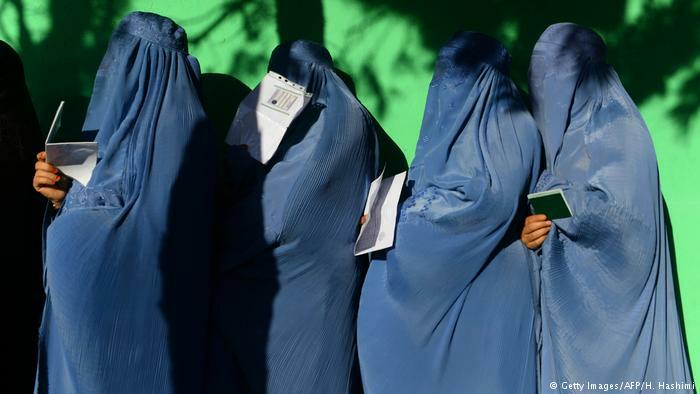 It is a dapper take on the traditional sky-blue burka worn by the few other women seen in public in Jalalabad. For six days a week the women gardeners – all of them poor and many of them widowed – are busy between the rose hedges and the fruit trees. Their salary, amounting to roughly $130 per month, is for most of them the first they have ever earned. In this photograph taken on April 23, 2018, female Afghan municipality employees, supported by United Nations agency UN-Habitat, water a garden in Jalalabad. Employing women was not an obvious choice in Nangarhar. The province – home to the Tora Bora mountain range, where al-Qaida leader Osama bin Laden hid after the 9/11 attacks – is now a stronghold of the Islamic State group, where they compete with the Taliban. 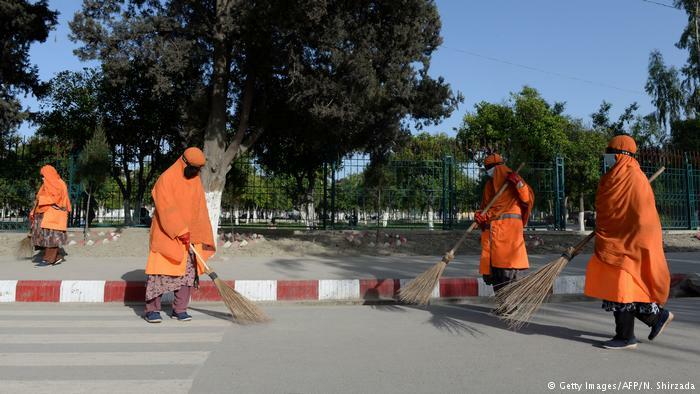 Female Afghan municipality employees, supported by United Nations agency UN-Habitat, sweep a street in Jalalabad. 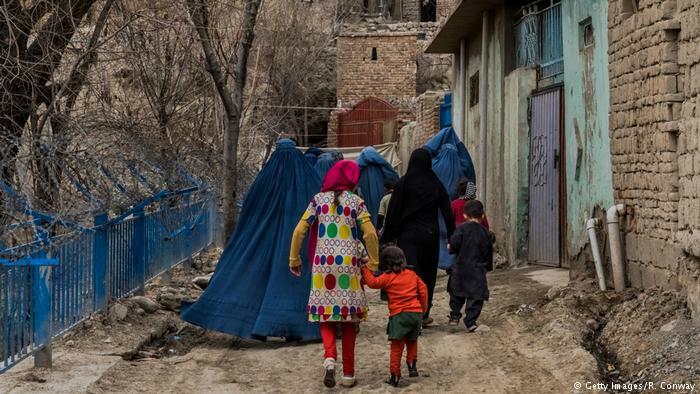 The programme, launched in 2016, aims to create, rehabilitate and maintain urban parks in Afghanistan’s main cities by employing the most vulnerable: including women and those displaced by war. Some 8,000 apprentice gardeners selected from among these populations have been hired in a dozen provinces, including Kabul. Among them are 1,000 women. 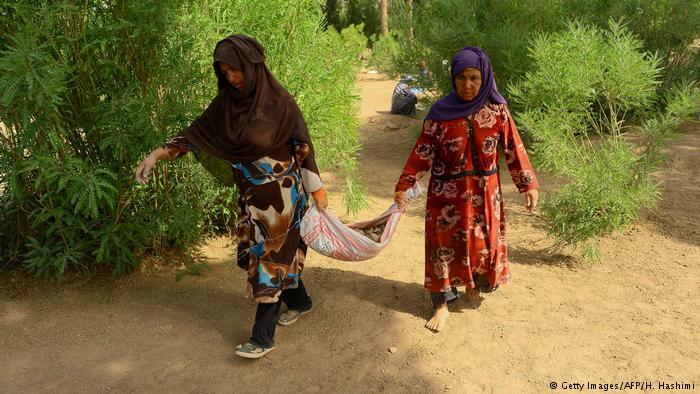 One hundred of them, aged 18 to 60, are active in Jalalabad. “Jalalabad and Kandahar have been proved the most difficult areas to work in,” says Sargand, citing the southern city that is the birthplace of the Taliban and, like Jalalabad, a Pashtun and conservative bastion. In an Asia Foundation study in May 2017, 66 percent of Pashtun Afghans surveyed accepted the idea of women working outside the home – compared to 74 percent of the national average. 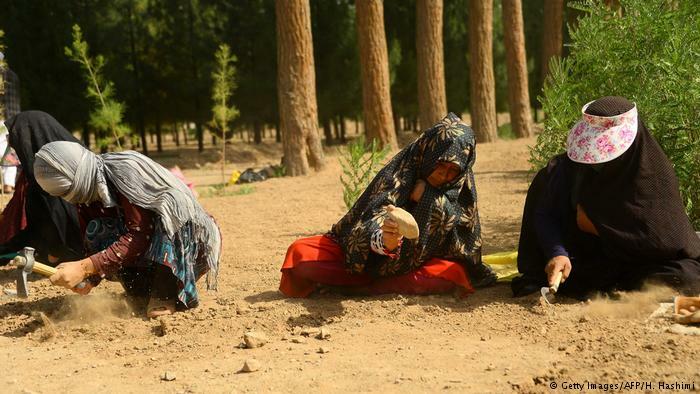 In this photograph taken on June 2, 2018, Afghan women work the soil at a park in the city of Herat. 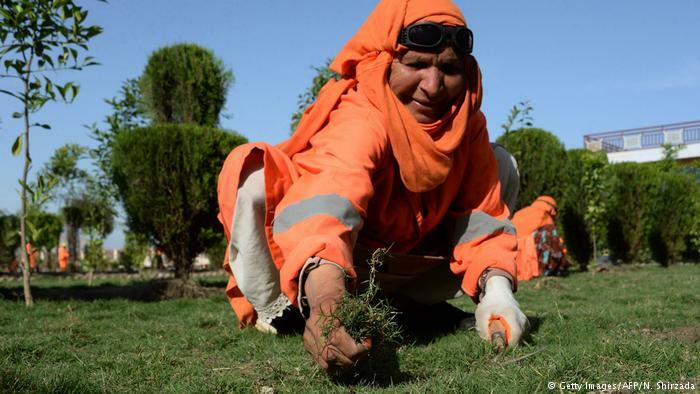 A female Afghan municipality employee, supported by United Nations agency UN-Habitat, removes weeds at a garden in Jalalabad. In the absence of funding, the greening agenda for Afghan cities is set to end in June in Jalalabad and by December elsewhere. But with the support of enthusiastic municipalities, UN-Habitat hopes to convince donors to continue funding the programme.